As different as Justice League and Crisis on Earth-X are in shape and style, they’re both trying to tell similar stories. It’s just that Crisis tells that story much, much better. As dire as the DCEU may seem right now, not all hope is lost. Warner Bros.’ film division just needs to pay attention to what their television arm is doing right. Though it’s now become a sprawling multiverse of interconnected heroes, villains, and crises on infinite earths, the Berlantiverse began small with a man and a bow. The scope of Arrow’s first seasons pales in comparison to what it’s become more recently, but by gradually building up its characters and the world they live in, the show was able to set the stage for things to come as more and more of DC Comics’ mythos began to manifest itself. 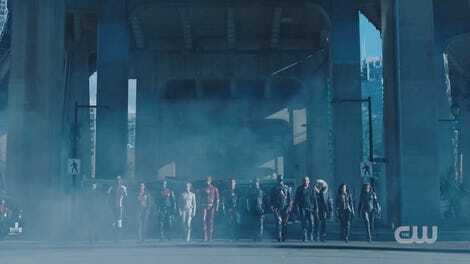 In time, The Flash, Legends of Tomorrow, and Supergirl would follow suit with each successive show building on the foundation Arrow built, but the shows did more than simply grow the number of DC heroes you could see on television in a given week. Each of the CW’s cape shows put in the time and effort to ground their characters in worlds and situations that gave audiences a chance to understand them as both heroes and people. As insignificant as some of those those discrete character quirks might seem from episode to episode—Cisco likes bad puns, Oliver’s crap at expressing his feelings, etc.—they’re important when you’re leading up to something like Crisis. Because big crossovers that bring teams together to save the world inevitably get busy, messy, and difficult to connect to. You need that very simple—but very important—sense of humanity to cut through the massive set pieces and CG to remind you who these heroes are and why you care about them. The CW (and CBS, for a season) did this by simply taking their time, a luxury uniquely afforded to them by the very nature of episodic content, but that doesn’t mean WB’s films can’t take note. It’s fair to say DC shot itself in the foot by trying to play catchup with Marvel and fast-tracking the DCEU. Batman v Superman crammed its titular heroes, Wonder Woman, Doomsday, Lex Luthor, Mother Boxes, and Steppenwolf into a single film without providing any legitimate sense of gravity to the story. As funny as “I thought she was with you” is as a line, it’s actually a pretty damning recognition of the fact that BvS handled its holy trinity like a bunch of random action figures thrown into a toy box and shaken around for fun. The initial joy of these things is seeing the characters on screen together running around and saving the world, but it’s the their interactions with one another that make the narratives compelling and robust. But you can’t really have strong character interactions in a film where the audience doesn’t exactly know who the characters are. Wonder Woman (and Man of Steel, to a much lesser extent) did the important work of teaching us who their heroes were as individuals within the context of a shared universe. That’s one of the many reasons Diana’s interactions with the other heroes in Justice League stand out—because audiences have a strong sense of her personality and where she’s coming from. The same isn’t quite as true of Superman... because Man of Steel never quite got beyond imbuing the DCEU’s Clark with definitive personality, but that’s a conversation for another day. 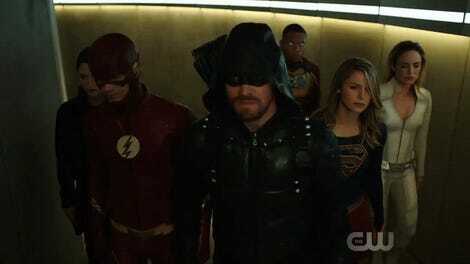 That sense of joy you feel seeing Barry and Kara race across the planet just for fun is what makes seeing them fighting alongside one another feel so satisfying. You know they’re friends, they care about one another, and don’t see their heroics as a job, per se, but a duty they wholeheartedly enjoy partly because of the company. If Superman and the Flash’s race at the end of Justice League is any indication, WB understands that on some level and wants the franchise to get to a similar place. But camaraderie and rapport aren’t the only thing Crisis had in spades that Justice League generally lacks. A strong, tight plot is crucial to tying together something as large and potentially unwieldy as these tales. Because Justice League is mostly an origin story for three of its lead characters, by the time we get around to seeing them actually team up and save the world, the film feels overly long, as if it’s trying to do too many things at once. Not only does that hold the newer characters back from shining as bright as they could, but it makes the film’s villain feel like an afterthought. By comparison, Crisis gets right down to business: When Nazis interrupt your wedding, you spring right into action, punching first and asking questions later. What Crisis’ plot lacks in grandiosity, it makes up for—literally—in heart. Barry and Iris’ wedding, the Nazi invasion, and the attempted murder of Supergirl all fit together neatly as a set of threats posed by the Earth-X villains. The danger posed by Crisis’ villains is evenly paced throughout the entirety of the event and by the time we actually see the two sides go to war, it feels like an appropriate culmination to an epic superhero journey. Though they’re working from the same source material, WB’s television and film branches are playing very different games, each with their own set of rules. The CW has to hold audiences week to week whereas Warner Bros. Studios has to rely on the grandeur and spectacle of its films to draw audiences into theaters. But there’s something to be said for remembering what makes smaller things strong even when you’re playing in the big leagues.